Nobody wants to deal with acne. Not only is it uncomfortable and bothersome, you also can’t hide it so easily, especially when it comes to acne on your face. These groupings of pimples are red and swollen and can spread all over the place, making your skin routine just plain annoying. And even though there are many options out there to treat the issue, there are times when it can’t get rid of the evidence – scars. They are a common result of acne and come in varying degrees of severity after treatment. What are Acne Scars and How do I Identify Them? Will Acne Scars Go Away? Normally, your body will naturally clear itself of the pimple and your skin will go back to normal. But there are times when it doesn’t. If acne is persistent and doesn’t go away, the collagen and elastin that make the skin able to stretch will start to break down. This is also true if the pimple is so severe and large that it stretches skin tissue more than average. When your body heals the area, the ruined collagen has trouble re-building itself, laying down an abnormal amount of skin and collagen, creating a raised or depressed spot, which is an acne scar. Scratching or picking at acne will only increase scarring. In the cases of acne, the scars are usually depressed into the skin and occur in groupings wherever the acne had been located. They can be skin colored, lighter, or darker. Ice pick: These are deep and narrow with jagged edges. Boxcar: Rectangular and wide, these have straight, defined edges. Rolling: These have rounded, sloping edges. To find out what some of the best products for acne scars are, go here. Acne isn’t only specific to the face. There are times when it can spread to your chest and back. When it comes to back acne, there are different types you can have, including cystic acne and regular acne. Getting back acne can be prevented in many circumstances. Since sweat is a major contributor to acne, leaving on sweaty, dirty clothing can cause unneeded pimples and acne. Wearing heavy fabrics can increase the amount of sweat on your body as well. Make sure to always wear breathable clothing, wash your back daily with a gentle cleanser, and change clothes as soon as they become sweaty. Cystic acne is especially hard to treat on the back, and usually requires medical intervention. Although it can definitely be cleared up, the acne on your back can leave scars just like it can on your face. Go here for more details about how to get rid of acne scars naturally. Cystic acne: This type of acne occurs when dead skin and debris clog very deep inside the pore. There is more inflammation and swelling, producing larger, redder bumps in the skin. 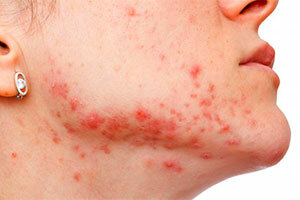 Severe acne: When acne spreads to a large area and persists for longer periods of time, it’s considered severe acne. This type usually comes with some pain and discomfort, and doesn’t respond to treatment easily. 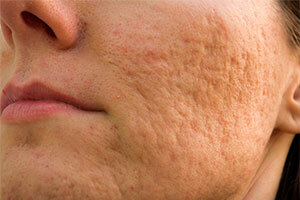 When acne scars run deep: More tissue damage will occur the longer the pimple is in your skin. When the blockage is deep inside the pore, like with cystic acne, there is more inflammation, which leads to more damage and breakdown to your collagen. The deeper the acne goes, the greater the scar will be. Sunburns will make acne scars more noticeable. Light acne scars: The color to your skin is produced by Melanocytes, cells that produce the Melanin that creates pigment. When skin tissue is injured, it can destroy these Melanocytes, meaning that little to no color will be produced in that specific area. Mild scarring: When your acne isn’t widespread or severe, the chances of a scar being left behind are minimal. If you do get a scar, it will not usually be very noticeable. Raised scars: If too much collagen is produced as your acne heals, it can bulge up out of the skin as a raised mark, called a hypertrophic scar. They can vary in color but are usually light. There is a difference between acne scars and acne marks. Marks are leftover inflammation and redness from the pimples, while scars are actual deformations in the skin’s collagen and tissue layers. Even though acne scars can fade with treatment, they are more permanent than acne marks, which will go away over the course of a few months. Red, brown, or pink: As your body heals itself from the acne, it takes a little time for the redness and inflammation to go away. And even when the blemish is gone, the leftover irritation can keep the mark colored for a short period of time. Purple: Broken and damaged blood vessels can leave the acne mark so dark that it looks purple. These usually fade to red, then pink, then white or skin colored. White: When skin damage occurs down deep, Melanocytes are too broken to produce pigment anymore, causing the scar left behind to be white. Hyperpigmented: This is when the acne mark or scar is a darker color than your skin. Most often, this happens in people with dark skin tones. Excessive sunlight can make an acne mark appear darker as well. The bad news is that scars don’t necessarily go away completely. The good news, however, is that there are numerous methods that can treat and fade the scar to where it is almost unnoticeable. Sunscreen to prevent scars from becoming more obvious. Topical creams that are Vitamin C or retinoid based. These promote collagen production that can help fill in depressed scars and heal damaged skin. For more information on acne scar cream, go here. Steroid injections. This will decrease inflammation which heals the pimple faster, and makes scars appear more flat and even. Dermal fillers that help to elevate depressed scars, making them far less noticeable. Laser treatment. Used for both old skin colored scars and colored ones, lasers help to re-surface the skin and make scars less red and noticeable. If you need more details on laser acne scar removal, visit here. Home remedies. Products like essential oils can help visibly reduce scarring. 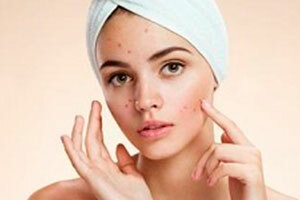 Find more about home remedies for acne scars here. For more detailed information on acne scar treatment, go here. Don’t despair if you’ve got scars left behind by acne. With all the treatments available, it is very possible to make your blemishes smooth and almost unnoticeable. And remember, prevention is key — don’t pick or scratch at your acne, and give yourself the best chance at a scar-free body. Click here to find more about how to get rid of acne scars.